The Gearrchoille Wood is a 30 acre semi-natural ancient broadleaved woodland, predominately oak and birch, situated to the south of the village of Ardgay on the Dornoch Firth, Sutherland. It was gifted to the community by Balnagown Estate in 2003. The site has been used in the past for curling; grazing livestock; it contains the line of an old drove road, and the coppiced trees would suggest timber production. Since being in the care of the local community, access has been improved, the former curling pond has been restored as a wildlife pond and the wood is used as a venue for a variety of community events. Join us! Download a membership form. Use the button at top of page to view our Facebook page. We organise a regular volunteer afternoon - 1st Thurs of the month @2pm - where we meet to carry out routine maintenance tasks in the wood, such as path maintenance, birch thinning & pond clearing. All welcome. 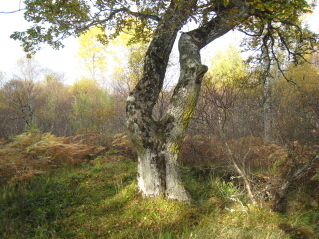 Native Woods mainly consist of tree species that arrived in Scotland without human assistance. Semi-natural woods are self sown naturally regenerating woodlands. 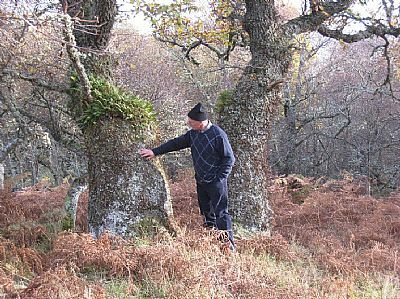 Ancient woodlands are directly descended on the same site from the original 'wildwood' that established itself in Scotland when the ice retreated after the last ice-age.